Saturday night, I had the pleasure of attending a Spotify party, thrown by Spotify – the best music service available. If you’re expecting more information about the Spotify service, I unfortunately need to quench your hopes right now; this post is just about the party (although I did find out some things about Spotify, which makes its future even more promising!). At the time, Spotify is only available through invites, and sorry, I don’t have any invites to give away. I had been feeling very low all day, since I seemed to have caught some variation of the flu. Therefore, I just dragged my feet around, just wanted to sleep, but still, I knew I couldn’t miss an event such as the Spotify party. So, I collected myself, took forever to shower and shave, and decided to take the car to the event (since there was no chance I’d survive either of drinking and commuting). 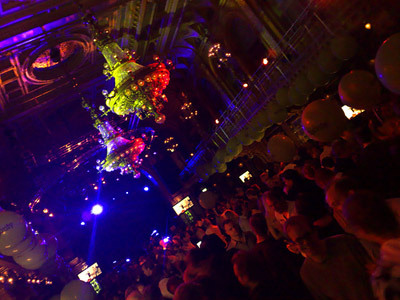 The party took place at Berns, and when I got there at about 21.00, it was almost already filled to the brim. At the door, I got a couple of drink tickets to enjoy myself with. “Drink tickets”, perhaps a few people from the US might ask. Over here, all drinks are free at the really good parties. Well, here in Sweden drinks costs about the same amount of money your banks seem to be losing every day, and people here drink a lot. So, if any company would have a party of this magnitude, with completely free drinks for everyone all night, it would soon go into bankruptcy. Yeah, really. Having just one invite, going alone, I drifted around, back and forth, desperately looking for someone I knew. Being IT people there, I was sure I’d stumble upon someone, sooner or later. The only people I did find was two people I know at Spotify: Andreas Ehn and Magnus Hult. While they’re both very nice, I didn’t want to harass them for too long, mainly out of two very obvious reasons, really: it was their event and tons of people wanted to talk to them, and also that I was probably the least fun and interesting company available. Oh, how I loathe Guitar Hero. I hate that game. Or really, there’s nothing wrong with the game, per se, and it’s somewhat fun playing (although I prefer to play a real guitar). 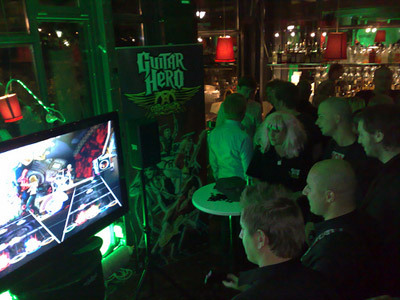 But I really, strongly wish that I will, in the foreseeable future, attend a party where Guitar Hero isn’t present. Why? Because while it’s ok playing, it’s dead boring watching and standing around. However, since I was practically alone, me and my glass of Coke (the drink) had to find some place to stand and hang out, since it was getting tiresome walking around, trying to look busy and/or like I was looking intensely for someone. After having been at the party for about an hour, I started to feel a bit lonely, and called Emil, since I knew him and Lady S. (his squaw-to-be?) were to attend. Luckily, they were on their way there, so I exhaled and felt a bit better. Kept on watching Guitar Hero (yay), and while doing that I felt a tap on my shoulder. It was my pal Jim, who I didn’t even know was going! Apparently, his neighbour was one of the artists performing later that night, so he and his friend Adam had gotten tickets to the event as well. Jim and Adam went to leave their jackets, and while doing that, Emil and Lady S. popped in! Finally, I knew loads of people! We first mingled at the bar for quite some time, and when the performances started, we moved into the large party room/concert venue and watched. There were tons of people now at the party, and it really took some effort to get anywhere amongst the masses, not to mention the ridiculously long lines to the bathroom. – Are you in a band? – No (thinking: why would I be in a band?). – So what the hell were you doing in there? – Looking for a bathroom. No more replies, except for some possible grunting, but with looks filled with hate. After the performance of Jim’s neighbour, he got an SMS from him, wanting to meet. After a cat-and-mouse chase and some very vague descriptions, we finally found our way backstage (no guards there, why would there be, they were busy guarding potential bathroom-queue elopers). After following a maze of fire-stairs, corridors and what-not, we eventually got to the backstage area. Something I found fantastic, since there were nice couches to sit in, free coke to drink (and naturally, alcohol for those physically fit for it) and free candy in bowls for anyone to eat. Given how tired and worn I felt at this moment, it was heaven to me! No being pushed every other second by over-refreshed people, no overpriced drinks (I was out of drink tickets at this time), and no loud music, so we could actually talk. – Oh, ok. It’s cool, either way. Being actually there, let me be the first to point out that it was totally clear that it wasn’t a racist question, but rather an attempt to find a topic to start a conversation with. It did sound both funny and weird when it came out, though. I think this is due to that, as far as I know, to begin with we don’t have that many people with a Jewish heritage in Sweden, and second, we don’t really care where people are from, so the word Jewish is just very seldomly mentioned here. After some people was thinking that it was a bit lame/low-key backstage (still heaven for me 🙂 ), they started to play some music and bringing some life to it. Something I would’ve liked under usual circumstances, but now I was just way too tired. I decided to leave them to their fun and avoid ruining their party out of being plain boring, and instead started my journey home. What? You were hanging out with all the cool people backstage? Damn it, that explains I couldn't find you anywhere 🙂 Nice party, only thing missing was Spotify giving out a shitload of invites to us. Oh funny that you link to the Berns website 😉 It was actually me who wrote the new HTML/CSS and implemented the "HTML/CSS framework" for the CMS, now some other guy implements the rest.